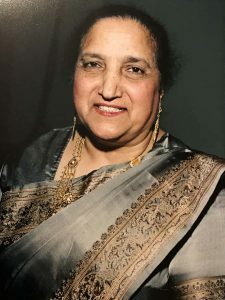 Atwal, Mukhtar Kaur (nee Deol), of Surrey, passed away peacefully on December 1, 2018 in Vancouver from a lengthy battle with cancer. Mukhtar was born on May 28, 1939 to Udham Kaur and Naranjan Singh Deol in Jalandhar, India. Mukhtar grew up in a warm and nurturing family that moved between Lahore, Pakistan, Jalandhar and Jagatpur, India. She attended Punjab University where she earned a Bachelor’s Degree in Home Economics and a Masters of Arts in Music at a time when it was rare for a women to receive any type of education. During her youth she developed a deep love of music, the arts, sports and the Punjabi culture. She could communicate in three languages, including English which would allow her to help her family settle in Canada. Mukhtar married Nazar Singh Atwal on January 29, 1967 and moved to England in 1968 and then to BC in 1970 where she spend the remainder of her life raising her extended family including her brothers-in-law and sisters-in-law who she thought of as her own. She and her husband Nazar thrived in Vancouver and over the years had two beloved daughters and sons, Meena (Tejinder Sahi), Raminder (Tajinder Pooni), Jaskarn (Nina Sidhu) and Rajveer (Meena Hans). Her family expanded and she was quickly surrounded by her loving grandchildren, Devon, Damon, Jada, Drayden, and Kane Atwal, Justin and Amira Pooni, and Jovan and Anaykta Sahi, who were very close to her. In the early years after moving to Canada she supported many others to immigrate to Canada and successfully settle into family life. She worked to build a strong vibrant Punjabi and Sikh community in the Lower Mainland. Coming from a family of public servants that were involved in athletics, education, the arts and culture, she tried to recreate aspects of this in her new home in Vancouver. She promoted service and was active in gurdwaras in Delta, Surrey, and Vancouver. Over the years she supported the formation of the Surrey India Arts Club, various gurdwara tournaments, the Punjabi Market, the Nagar Kirtan, the promotion of Punjabi culture, food, and clothing. She often found the right mix of North American culture and Punjabi culture building bridges between the two, paving the way for others to follow. She advocated for higher education for all youth in the growing Punjabi community, but especially focused in promoting education for females. After her first lengthy battle with cancer she supported other families by sharing her experience and promoting education about the disease. Mukhtar loved cooking and entertaining and it brought her great joy to host gatherings large and small with friends, family and the larger Punjabi community. She was a devoted wife, mother, sister, bhabhi, Nani-ji and Dhadi-ji. Mukhtar taught her children and grandchildren the value of hard work, respect, kindness, remaining close as a family unit and looking after each other. Mukhtar is survived by her beloved husband of 51 years, Nazar Singh Atwal, her brothers Jagthar Deol and Gurdithar Deol and her sisters Joginder Dhesi, Jagthar Dosanjh, and Gurinder Dhothar. She also leaves behind behind her brothers-in-law, Major, Bahadur, and Makhan Atwal, Bakshish Sandhu and her sisters-in-law, Sarbjit (Bakshish Sandhu), Surinder (the late Swarn Mahli) Kirpal, Balbir, and Manjit. Mukhtar was preceded in death by her dear mother Udham Kaur Deol, dear father Naranjan Singh Deol, father-in-law Amar Singh Atwal, mother-in-law Gurmej Kaur Atwal, and caring brother Mukhtar Singh Deol (Deputy Sports Minister of Punjab). During her life her greatest desire was to nurture loving relationships with the Sandhu family, Mahli family, Sidhu family, Hans family, Pooni and Sahi family, and her many other families and friends who in turn brought her great comfort and peace with their endless seva in her final year of illness. In lieu of flowers, donations to the Canadian Cancer Society are welcome. In Mukhtar’s memory and to show reverence for her three hard fought battles with cancer over the last 40 years, your contributions towards patients in BC suffering from this cruel disease will further support research. Funeral services will be at Riverside Funeral Home, 7410 Hopcott Road, Delta, on Sunday, December 9 at 2 p.m. This will be followed by Sehaj Paath Da Bhog at Indian Cultural Center of Canada, 8600 No. 5 Road, Richmond, directly following the funeral services. What a beautiful tribute to an amazing woman who contributed so much to her beloved family, friends and community. My thoughts and prayers are with all of you as you grieve the loss of such a beloved lady and celebrate her life and accomplishments. What a wonderful woman who led such an amazing life while accomplishing so much for others. She will be missed terribly. Our thoughts and prayers are with the family. Little did we meet but heard lots of good things about bahenji. May her soul rest in peace and waheguru di charna che niwas bakshish kare. With love and respect from Mrs & Late Mr. Charan Singh Nagra and family. What a beautiful tribute to a loving soul. Who has left a footprint by doing great service to the community, which she was proud off.R.I.P mrs Kaur.our heartfelt condolences to her Family. May God provide you all with strength & peace at this difficult time. Our prayers with you all. God bless.